PVMBG reported that during 21 April-21 May dense white plumes rose as high as 700 m above Slamet's crater. Seismicity consisted of emission signals and tremor; RSAM values fluctuated. The Alert Level remained at 2 (on a scale of 1-4). Residents and tourists were warned to not approach the crater within a radius of 2 km. The most recent Bulletin report on Slamet volcano detailed an eruption from approximately April to June 2009 (BGVN 34:05). From January 2011 to May 2015 (the period covered by this report), one period of eruptive activity occurred between 14 March and 18 September 2014. The eruption was characterized by ash plumes up to 4.6 km, ashfall up to 20 km from the summit, and numerous incandescent lava ejections. Thermal anomalies from this eruption were recorded in the MODIS/MODVOLC satellite data and two reports of ash explosions were observed by the Darwin Volcanic Ash Advisory Center (VAAC). Between late September 2014 and May 2015, the volcano continued emitting steam plumes but there were no further explosions. The Pusat Vulkanologi dan Mitigasi Bencana Geologi (PVMBG, also known as Indonesian Center for Volcanology and Geological Hazard Mitigation) reported that between 6 September 2009 and July 2011 there were no eruptions from Slamet. Intermittent steam plumes rose as high as 500 m above the crater. Seismicity and the temperature of hot water from nearby springs both decreased from earlier levels. On 11 July 2011, the Alert Level was lowered to 1 (meaning normal, on a scale of 1-4). No further reports of Slamet volcanic activity were offered until March 2014. Renewed activity during March-September 2014. Both shallow and deep volcanic earthquakes at Slamet increased in frequency beginning in early March 2014. Observers at a post in Slamet Gambuhan village, about 10 km N of the volcano, also noted that increasingly dense steam plumes rose to 600 m during the first week (1-7 March), and up to 1,000 m during 8-10 March. This prompted PVMBG to raise the Alert level from 1 to 2 on 10 March for the first time in 3 years. Steam plumes were rising as high as 1.2 km by 14 March when incandescence from the crater was observed at 2148 during an eruption. Ash plumes rose 800-1,000 m and drifted E.
Brownish-white steam plumes rose as high as 2 km during 15-21 March 2014. For the rest of March and April, white steam plumes rising to 600 or 800 m were more typical. Ash explosions were observed every week from 15 March through late April, rising as high as 2,000 m in late March and early April, drifting both E and W, depending on weather conditions. An increase in intensity of the explosions near the end of April prompted PVMBG to raise the Alert level to 3 for a brief period between 30 April and 12 May, requiring people to stay at least 4 km from the volcano. Ejecta from the volcano fell 300 m from the summit during 19-25 April. Tephra during 26-30 April fell as far as 1,500 m W of the summit with ash plumes rising to 1,700 m. Incandescence was observed hundreds of times between 26 and 29 April. The rumbling reported between 27-29 April was strong enough to rattle windows at the observation post 10 km N. MODIS/MODVOLC thermal satellite data recorded hot spots during 18-30 April, correlating well with the observations of incandescence. Various seismic signals including explosion earthquakes, emission earthquakes, and shallow and deep volcanic earthquakes fluctuated during 8-28 March 2014. During 29 March-30 April 2014 seismicity from explosions and emissions increased noticeably (figure 4) and inflation was detected. There was also a dramatic increase from 6% to over 70% in the dissolved carbon dioxide content of a hot spring on the south side of Slamet during 17-20 March 2014. Figure 4. Earthquake statistics for Slamet volcano for the period 1 January 2014 to 20 May 2015. The graph portrays several types of seismic activity: tremors, explosions (letusan), ash/steam emissions (hembusan), VB – shallow volcanic earthquakes, VA – deep volcanic earthquakes, TL – local tectonic earthquakes, and TJ – far tectonic earthquakes. The vertical color bands show the changes in the Alert Level during the period of this report: Green, Level 1 (normal); Yellow, Level 2 (alert); and Orange, Level 3 (standby). On 10 March 2014 the Alert increased from Level 1 to Level 2, and on 30 April 2014 increased to Level 3, then lowered on 12 May back to Level 2. On 12 August 2014 the Alert was raised to Level 3, then lowered back to Level 2 on 5 January 2015. Image courtesy of PVMBG . PVMBG reported that in May 2014, incandescence was visible 14 times and there were ash plumes reaching 150-1,500 m above the summit that drifted NW and W. White steam plumes were typically visible 300-800 m above the summit. The volcano was quieter in early June with steam plumes rising only to 500 m and no ash explosions reported. Eruptive activity steadily increased from mid-June through August. During 15-30 June there were 14 moderate explosions reported that generated ash plumes 500-1,400 m above the summit and drifted N and W. Thirty-one explosions of ash were observed during the first two weeks of July that generated 300-1,500 m high plumes, drifting N and W. A very active interval with 148 observed ash plumes from 15 to 31 July sent plumes up to 2,000 m above the summit that drifted N and E. Based on analyses of satellite imagery and wind data, the Darwin VAAC reported that on 18 July 2014 a low-level ash plume rose to an altitude of 4.6 km (15,000 ft) and drifted 83 km W and N.
In early August 2014 thick gray ash plumes rose 300-800 m above the summit drifting N, E, and W, with 100 explosions observed between 1 and 12 August. Seismicity also increased, and ejected material was deposited on the flanks as far as 1,500 m to the W and SW from the crater. Incandescence and rumbling/roaring noises were also reported. The Alert Level was again raised to 3 on 12 August 2014 and remained there through the end of 2014. A large number of incandescent lava ejections were reported during September. One active period that month was 9-11 September, when brownish steam plumes rose to 1,500 m and incandescent lava ejections were observed up to 600 m above the summit more than 200 times. On 17 September a 1,200-m-high ash plume drifted S and SW from the summit, and several incandescent lava ejections were observed up to 500 m above the summit. Ash deposits 0.1-0.2 mm thick was reported 20 km S of the volcano. Darwin VAAC also reported ash drifting E at 4.6 km (15,000 ft). Incandescent ejections and a 500-m-high ash plume drifting W was also observed on 18 September (figure 5). The MODVOLC satellite image data again reported hot spots at Slamet between 28 July and 12 September 2014, which correlates with the most observations of incandescence from the volcano during this time. Figure 5. Mount Slamet emits lava and gas during its eruption as seen from Pandansari village in Brebes, Central Java, Indonesia on 18 September 2014. (Photo by Idhad Zakaria (AP) from time.com). While seismicity during March and April was dominated by emissions and explosion signals, during mid-September and October high amplitude tremors were abundant before tapering off at the end of November. Explosion signals stopped after mid-September, but the emission signals continued strongly through the period, although no more ash explosions were reported (figure 4). Deformation data indicated that relatively little pressure was accumulating due to magma movement. Post-eruption, September 2014-May 2015. Activity at Slamet decreased considerably after 18 September. There were no reports recorded for October. Except for a report in early November of steam plumes rising to 1,500 m, the plumes remained at or below 500 m through early January. Deformation and geochemical data showed no significant changes during this period. The Alert Level was lowered to 2 on 5 January 2015. During 1 February-10 April 2015 dense white plumes rose 50-800 m above Slamet's crater. Seismicity consisted of emission signals and a few tremors. The emission signals started to increase on 18 February and periods of continuous tremors were recorded during 21-22 and 28-29 March 2015, although no explosions were reported. Dense white plumes reported by PVMBG during 21 April-21 May 2015 rose up to 700 m above the crater with continued emission-related seismicity. Information Contacts: Pusat Vulkanologi dan Mitigasi Bencana Geologi (PVMBG, also known as Indonesian Center for Volcanology and Geological Hazard Mitigation, CVGHM), Jalan Diponegoro 57, Bandung 40122, Indonesia (URL: http://www.vsi.esdm.go.id/); Darwin Volcanic Ash Advisory Centre (VAAC), Bureau of Meteorology, Northern Territory regional Office, PO Box 40050, Casuarina, NT 0811, Australia (URL: http://www.bom.gov.au/info/vaac/); Hawai'i Institute of Geophysics and Planetology (HIGP), MODVOLC Thermal Alerts System, School of Ocean and Earth Science and Technology (SOEST), Univ. of Hawai'i, 2525 Correa Road, Honolulu, HI 96822, USA (URL: http://modis.higp.hawaii.edu/); Time.com, 18 September 2014 (URL: http://time.com/3397931/mount-slamet-volcano-indonesia/). PVMBG reported that during 1 February-10 April dense white plumes rose 50-800 m above Slamet's crater. Seismicity consisted of emission signals and tremor; emission signals started to increase on 18 February and periods of continuous tremor were recorded during 21-22 and 28-29 March. RSAM values fluctuated but rose overall. The Alert Level remained at 2 (on a scale of 1-4). Residents and tourists were warned to not approach the crater within a radius of 2 km. PVMBG reported that during 1 November-5 January white plumes rose at most 1.5 km above Slamet's crater. RSAM values fluctuated but decreased overall in December through 5 January. Deformation and geochemical data showed no significant changes. The Alert Level was lowered to 2 (on a scale of 1-4) on 5 January. Residents and tourists were warned to not approach the crater within a radius of 2 km. PVMBG reported that during 13-16 September white plumes rose 50-200 m above Slamet's crater. An explosion on 17 September produced a dense blackish-gray ash plume that rose as high as 1.2 km and drifted S and SW. Incandescent material was ejected 200-500 m high and booming noises were reported. Ash fell in areas as far as 20 km S. Although white plumes mostly rose from the crater the next day, an explosion generated an ash plume that rose 500 m and drifted W. During 19-20 September white plumes rose 100 m. The Alert Level remained at 3 (on a scale of 1-4). PVMBG reported explosive activity from Slamet during 4-12 September. During the past week, activity peaked with incandescent explosions; rumbling sounds were heard by scientists at the Slamet observation post. On 11 September the largest ash plume was observed (200-1,500 m above the summit) and incandescent plumes reached 400 m above the summit. Seismicity was dominated by emissions and explosion signals. Deformation data indicated that relatively little pressure was accumulating due to magma movement. PVMBG maintained the Alert Level 3 (on a scale of 1-4). PVMBG reported that during 1-12 August 100 thick gray ash plumes rose 300-800 m above the summit drifting N, E, and W, seismicity increased, and ejected material was deposited on the flanks 1.5 km from the crater on the W and SW at Slamet. Incandescence and rumbling/roaring noises were reported. The Alert Level was raised to 3 (on a scale of 1-4) on 12 August. Residents and tourists were warned not approach the crater within a radius of 4 km. Based on analyses of satellite imagery and wind data, the Darwin VAAC reported that on 18 July a low level plume from Slamet rose to an altitude of 4.6 km (15,000 ft) a.s.l. and drifted 83 km W and N.
CVGHM reported that incandescence had been visible 14 times in May and there were ash eruptions reaching 150-1,500 m above Slamet’s summit that drifted NW and W. White plumes were typically visible 50-800 m above the summit in May and June. There were 14 moderate ash eruptions during 15-30 June that generated plumes 500-1,400 m above the summit and drifted N and W. Incandescence was visible three times in June. During 1-2 July, there were 17 moderate ash plumes that generated plumes 300-1,200 m above the summit that drifted N and W. Alert Level 2 was maintained and visitors and tourists were prohibited from approaching the crater within a radius of 2 km. BNPB reported that the Alert Level for Slamet was lowered to 2 (on a scale of 1-4) on 12 May because activity had decreased. Visitors and tourists were prohibited from approaching the crater within a radius of 2 km. PVMBG reported that during 8-14 March dense white plumes rose as high as 1.2 km above Slamet, and ash plumes rose 800-1,000 m and drifted E. Incandescence from the crater was observed at 2148 during an eruption on 14 March. Brownish-white plumes rose 2 km on 15 March and ash plumes rose 1.2 km and again drifted E. During 22-28 March white-to-gray plumes rose 1.3 km. Dense gray ash plumes rose 2 km and drifted W. White plumes were observed on 29 March. Various seismic signals including shallow volcanic earthquakes, harmonic tremor, and volcanic earthquakes fluctuated during 8-28 March. Carbon dioxide emissions significantly increased during 17-20 March. PVMBG noted that activity, based on visual and instrument monitoring, continued to fluctuate; on 29 March the Alert Level remained at 2 (on a scale of 1-4). Residents and tourists were warned not approach the crater within a radius of 2 km. The Darwin VAAC reported that on 12 September a low-level ash plume from Slamet was observed by a pilot. Ash was not identified on satellite imagery. Based on a pilot observation, the Darwin VAAC reported that on 8 August an ash plume from Slamet rose 90 m above the summit. Ash was not detected in satellite imagery. CVGHM reported that during 8-28 June tephra was ejected 50-700 m above Slamet's crater and incandescent material was ejected 50-300 m above the crater. Booming noises were reported. During 23-29 June, incandescence and ash emissions were not observed. On 29 June, CVGHM lowered the Alert Level for Slamet to 2 (on a scale of 1-4) because of decreased seismicity and emissions. CVGHM reported that during 26 May-4 June activity from Slamet fluctuated, but decreased overall. The number of earthquakes and the temperature of water in areas around the volcano were lower. Inflation and deflation fluctuated within a range of 2 cm. White plumes rose 100-750 high. During 5-7 June, activity was characterized by inflation and an increased number of earthquakes. During that time, white plumes were accompanied by ash emissions that rose 200-800 m from the crater, incandescent material was ejected 50-200 m above the crater, and booming noises were reported. The Alert Level remained at 3 (on a scale of 1-4). Based on ground information from CVGHM, the Darwin VAAC reported that on 27 May an ash plume from Slamet rose to an altitude of 4.3 km (14,000 ft) a.s.l. Analysis of satellite imagery indicated that a possible plume rose to an altitude of 6.1 km (20,000 ft) a.s.l., but ash was not conclusively detected. On 26 May, CVGHM reported that since 21 April seismicity from Slamet continued to increase or remain elevated; the peak of activity was on 17 May. White-to-brown "eruption smoke" rose about 800 m above the crater and inflation was detected. Ashfall was detected in areas 5-9 km away. The temperature of water in several locations on the flanks increased. During 12 and 21-23 May, lava fountains rose 100-400 m above the crater rim. White-to-gray "smoke" rose 150 m above the crater and ejected incandescent material onto the W flank. On 22 May, ashfall was reported in Sawangan village, 5 km W. On 23 May, an ash plume rose 1 km above the crater and ash fell on the N flank. Ash accumulated to1 mm near the observation post. The next day, an ash plume rose 700 m above the crater. The Alert Level remained at 3 (on a scale of 1-4). During 23 April-5 May, CVGHM reported that seismicity from Slamet increased and an eruption originating from the western part of the crater continued. During times of clear weather, observers reported that incandescent lava, ejected 25-100 m above the crater, fell back into and around the active crater. Gray and white "smoke" rose 100-800 m from the crater. Occasionally a "thunderous" noise accompanied eruptions of ash. The Alert Level remained at 3 (on a scale of 1-4). CVGHM reported that seismicity from Slamet increased during 19-23 April. Diffuse white plumes rose about 50 m above the crater on 20 April. During 21-23 April, white and white-to-brownish plumes rose 50-800 m above the crater. On 23 April, the Alert Level was raised to 3 (on a scale of 1-4); people were advised not to climb the summit. According to a news article, a CVGHM volcanologist stated that lava was ejected 600 m high and ash bursts up to 112 times within a 6-hour period were detected. According to a news article, a volcano observer monitoring Slamet reported on 1 April that plume activity had increased in intensity and frequency over the previous two weeks. Plumes rose to an estimated altitude of 3.8 km (12,500 ft) a.s.l. Slamet began to erupt ash and incandescent tephra at about 1800 on  July. At 0700 the next morning, explosions were occurring once a minute, ejecting incandescent fragments to 500 m above the vent. Ash fell 45 and 85 km NE at Cirebon and Brebes. By 1500, eruptive activity had stopped but heavy fuming continued from one of the active craters, feeding an 800-m plume. The moderate activity was consistent with most of the volcano's 38 eruptions in the past 200 years and no evacuation was ordered. The eruption was preceded by periods of brief harmonic tremor on 9 July and six hours of increased seimicity including brief tremor episodes on 10 July. A second radio-telemetered seismometer will be installed on the volcano. The eruption that began on 12 July ejected incandescent lava to 100 m above the summit, accompanied by a 200-m fume cloud. Similar activity continued the next day [see also 14:11]. Between 14 and 19 July, heavy fuming produced an 800-m light-colored plume. After 19 July, only quiet fuming persisted. No evacuations were necessary. Increased seismicity (table 1) and gas emission have been observed at Slamet since the second week in October. A white plume rose as much as 300 m, compared to 100-150 m the previous week. Geologists noted that a small eruption could occur at any time. The alert level has been increased and local officials have been notified. Slamet's most recent activity was a weak 30-hour Strombolian eruption 12-13 July , preceded by tremor that began at 1145. No casualties were reported. Table 1. Seismicity recorded at Slamet, 7-10 October 1989. S-P of A-type events is 1.5-4 seconds. Courtesy of VSI. The crater was covered by thick solfataric gas, but no significant changes were observed during fieldwork. Earthquakes associated with gas emissions were recorded an average of 776 times/day. Harmonic tremor episodes (average frequency 2.5 Hz) began at 1730 on 24 June and were continuing as of early July. A dense 200-m-high plume was observed on 28 June. COSPEC measurements, started on 29 June, yielded SO2 fluxes of 66-87 t/d, compared to 30 t/d in 1988. Seismicity increased in January-February 1995. Continuous volcanic tremor (maximum amplitude 21 mm) was recorded during 14-19 January, followed by intermittent tremor (maximum amplitude 10 mm) until 26 January and during 6-10 February. Earthquakes associated with gas emissions were recorded at an average rate of 50 events/day in late January; by the end of February these had increased to 150 events/day (figure 06sla01f). No explosive activity was observed or detected. Figure 1. Daily number of gas-emission earthquakes and tremor amplitude at Slamet, January-February 1995. Courtesy of VSI. During September steam rose 150 m over the summit and seismic signals continued. Mount Slamet has been predominantly quiet since its last eruption in 1989. During the week of 27 April-3 May, however, the volcano's status was raised to "Alert." That week and the next, "white ash emissions" reached 400 m and hot-spring temepratures ranged from 40 to 81°C. Tremors constituted the dominate seismic events. Slamet ejected black ash from its crater over 1-2 May, prompting concern. Government officials warned residents to stay away from the area following several outbursts within a 10-day period. During 4-17 May seismicity was dominated by tremor with 4- to 30-mm amplitudes, and "thin-to-thick white ash plumes" reached 400 m height. During 18-24 May ash plumes only rose 25-100 m; tremor amplitudes declined to 0.5-20 mm. There was an increase in volcanic events, with B-type events increasing from 9 to 68 and A-type increasing from 10 to 26. Moderate eruptive activity at Slamet, including ash emission and seismicity of varying intensity, continued during June-September. On most days during this period a "thick white plume of ash" rose as high as 600 m above the summit. The thickness of the ash cloud increased in September. A new PS-2 type seismograph was added to the existing seismic monitoring network on 29 May. Tremor with amplitudes ranging from 0.5 to 15 mm was the dominant seismic type recorded during June. During 15-21 June tremor amplitudes ranged from 3-30 mm. In July small explosion earthquakes prevailed. Beginning in late July and continuing to 20 September, tremor was nearly constant with amplitudes up to 15 mm. Seismicity tended to increase toward the end of September (figure 2). Figure 2. Number of volcanic earthquakes (A- and B-type) recorded at Slamet during June-September 1999. Data courtesy of VSI. The following report covers mid-May to late October 2000. Activity increased during the third week of May when tremor events commonly reached amplitudes of 0.5-10 mm, and a white low-density plume rose 50-400 m above the summit. By the second week of June maximum tremor amplitudes reached 15 mm. A white gas-rich plume rose up to 200 m above the summit. In the last week of July, seismographs recorded 713 small explosion earthquakes along with tremor, and a dense white plume rose 300 m.
Similar activity persisted through mid-September, when tremor became continuous. The number of small explosion earthquakes increased; seismographs registered 3,244 events during 19-25 September, and 3,765 were registered during 26 September-2 October. A white, variable-density plume erupted continuously during the latter period. After 3 October, however, activity decreased significantly with explosion earthquakes decreasing in number to 199 during the next week. By mid-October both visual and instrumental monitoring confirmed a decrease in eruptive energy. Near the end of the month a low-density plume rose up to 300 m above the summit, but only volcanic tremor was recorded. Our last review of Slamet's activity was in November 2000, reporting a white, gas-rich plume from the stratovolcano (BGVN 25:11). We are unaware of subsequent reporting until 28 March 2007. Starting that day and through 3 April, a volcano observer reported that plumes had increased in intensity and frequency. This 7-day interval took place after two weeks of heavy rains. The plumes were of sufficient magnitude to be visible in the provincial capital, Semarang, over 138 km to the ENE. The plumes did not significantly impact residents in vicinity of the volcano. Thermal anomalies (MODVOLC) have been absent on the upper cone during 2000 through 5 June 2008. Information Contacts: Dali Ahmad, Center of Volcanology and Geological Hazard Mitigation, Saut Simatupang, 57, Bandung 40122, Indonesia (URL: http://vsi.esdm.go.id/); Hawai'i Institute of Geophysics and Planetology (HIGP) Thermal Alerts System, School of Ocean and Earth Science and Technology (SOEST), Univ. of Hawai'i, 2525 Correa Road, Honolulu, HI 96822, USA (URL: http://modis.higp.hawaii.edu/). Minor eruptions were reported at the active crater during April-June 2009. Small amounts of ash fell several times during May. Witnesses saw lava fountains on 12 and 21-23 May. Previously, steam plumes were associated with heavy rains during 28 March-3 April 2007 (BGVN 33:04). During 19-23 April 2009 Slamet's seismicity increased. On 20 April, diffuse white plumes rose ~ 50 m above the crater. During 21-23 April, the number of eruption tremors increased steadily, and dense, white-to-brownish plumes rose 50-800 m above the crater rim. The Alert Level was raised to 2 (on a scale of 1-4). On 23 April, the Alert Level was raised to 3; people were advised not to climb the summit. According to a news article in the Jakarta Globe, a volcanologist from the Center of Volcanology and Geological Hazard Mitigation (CVGHM) stated that lava was ejected 600 m high and ash bursts occurred up to 112 times within a 6-hour period. According to CVGHM, seismicity continued to increase or remain elevated during 23 April-17 May, peaking on 17 May. During this period, continuous eruptive quakes/tremors were recorded, together with an increase in amplitude (3-46 mm on 12-13 May, rising to about 20-32 mm between 17-24 May). Eruptions from the western part of the crater continued, and inflation was noted. During times of clear weather, observers reported that incandescent lava was ejected 25-100 m above the crater, and then fell back into and around the active crater. Gray and white "smoke" rose 100-800 m from the crater. Occasionally a thunderous noise accompanying eruptions of ash occurred, and ashfall was detected in areas 5-9 km away. The temperature of water in several locations on the flanks increased. During 12 May and 21-23 May, lava fountains rose 100-400 m above the crater rim. During several eruptions, ejected incandescent material traveled down the W flank. White-to-gray "smoke" rose 150 m above the crater. On 22 May, ashfall was reported in Sawangan village, 5 km W. On 23 May, an ash plume rose 1 km above the crater and ash fell on the N flank. Ash accumulated to 1 mm depth near the observation post. The next day an ash plume rose 700 m above the crater. Based on ground information from CVGHM, the Darwin Volcanic Ash Advisory Centre (VAAC) reported that on 27 May an ash plume from Slamet rose to an altitude of 4.3 km. Analysis of satellite imagery also indicated that a possible plume rose to an altitude of 6.1 km, but ash was not conclusively detected. CVGHM reported that during 26 May-4 June activity from Slamet fluctuated, but decreased overall. They found decreases in both the number of earthquakes and the temperature of water in areas around the volcano. Inflation and deflation fluctuated within a range of 2 cm. White plumes rose 100-750. During 5-7 June, activity was characterized by inflation and an increased number of earthquakes. During that time, white plumes were accompanied by ash emissions that rose 200-800 m from the crater, incandescent material was ejected 50-200 m above the crater, and booming noises were reported. As of 4 June 2009, the Alert Level remained at 3, based on visual data, deformation, earthquakes, and tremor. CVGHM urged the public to don face masks during heavy ashfalls, and to cover water sources to prevent contamination by volcanic ash. Information Contacts: Center of Volcanology and Geological Hazard Mitigation (CVGHM), Jalan Diponegoro 57, Bandung 40122, Indonesia (URL: http://vsi.esdm.go.id/); Darwin Volcanic Ash Advisory Centre (VAAC), Bureau of Meteorology, Northern Territory Regional Office, PO Box 40050, Casuarina, NT 0811, Australia (URL: http://www.bom.gov.au/info/vaac/); Jakarta Globe (URL: http://www.thejakartaglobe.com). Minor explosions at Slamet with occasional lava fountains and small ash plumes occurred from April through early June 2009 (BGVN 34:05). During the rest of June 2009, this activity continued. The Center of Volcanology and Geological Hazard Mitigation (CVGHM) reported that during 8-28 June, tephra was ejected 50-700 m above the crater. In addition, incandescent material was ejected 50-300 m above the crater. Booming noises were also reported. During 23-29 June, incandescence and ash emissions were not observed. On 29 June, CVGHM lowered the Alert Level for Slamet to 2 (on a scale of 1-4) because of decreased seismicity and emissions. Based on pilot observations, the Darwin Volcanic Ash Advisory Centre (VAAC) reported that on 8 August and 12 September 2009 ash plumes rose above the summit. In neither case was ash identified on satellite imagery. June 2009 observations at the summit. Thorsten Boeckel and Martin Rietze climbed Slamet on 13 June 2009 and spent a night at the summit and at their camp at 3,200 m (figure 3). 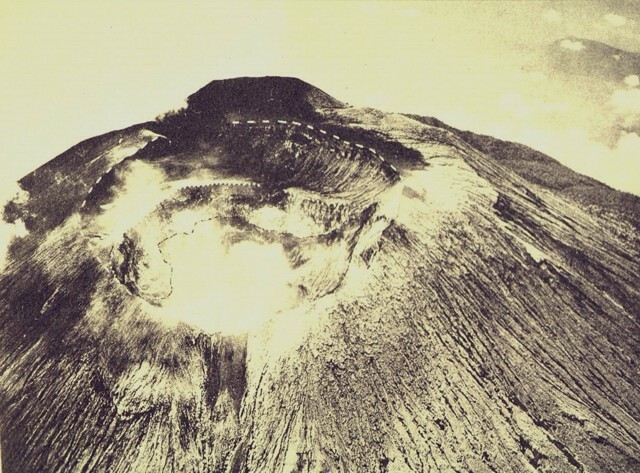 They said that reports issued prior to their climb noted plumes up to 700 m above the summit, but the activity later decreased to a point where the risk of being struck by a volcanic bomb had diminished, though hard hats were worn. These photographers have considerable experience on active volcanoes. Besides Strombolian eruptions, gas-fed flames sometimes reached ~ 20 m high (figure 3). Figure 3. Photos of Slamet taken on 13-14 June 2009, with most shot from the E crater rim. (A) One viewpoint for watching the crater. (B) Night scene showing two glowing vents at the top of the intracrater cone. (C-D) Night scenes with lava fountains, sprays of spatter, and flames near the vent. In daylight, one scene taken amid comparative calm (E) and sudden explosions (F-G). (H) Flames at the far vent, appearing as a broad luminous zone. Courtesy of Rietze and Boeckel. Approaching the summit they observed the vent to assess the risk and ultimately felt secure in advancing to more exposed positions on the rim. Deafening noise came from the two vents in the middle of the ~ 100-m wide intra-crater cinder cone. Figure 3 (B and E) present overviews of the active crater area. Two vents were glowing. Initially, each eruption had a similar character, starting with a emission of gas and flames with a slightly blue-green color rising ~ 5 m above the vent. These emissions and flames later grew to reach ~ 20 m above the vent. As the eruptions proceeded the emissions became increasingly red. Eventually there was an explosion and lava fountains jetted up to ~ 200 m above the vent. Occasionally a second vent glowed (figure 3, B and D, and due to flames in H). Fog at the crater made photography difficult at times. Strong luminosity from the gas flames would sometimes overexpose a portion of the photo. As dawn approached, more forceful tephra emissions generated billowing ash clouds (figure 3, F and G). Next, the loudest detonation of their stay occurred, but explosions did not become more violent over the next 6 hours. Boeckel and Rietze had observed flames here in 2006. Rietze, who has visited more than 24 volcanoes, said he had never seen such impressive flames as those at Slamet: "These flames [during the 2009 visit (figure 3 H)] were up to 10-20 m high...shining intensely even without ejecta. In fact this was the reason why all long exposure images were burnt out in the center, it was not possible to photograph the Strombolian phases as with other volcanoes due to this. Of [course, the flames] changed from time to time, sometimes there were flames only, and sometimes only Strombolian phases." Boeckel and Rietze also presented videos of vigorous flames on their websites. The cause of the flames remains uncertain in the absence of instrumental (eg., spectrometer) data. Occasional reports of combustion and flames are known at volcanoes, for example, from combustion of methane, or hydrogen (the latter, discussed by Naughton, 1973), and flames of various colors were documented in the 1943-1951 eruptions at Parícutin (Luhr and Simkin, 1993). 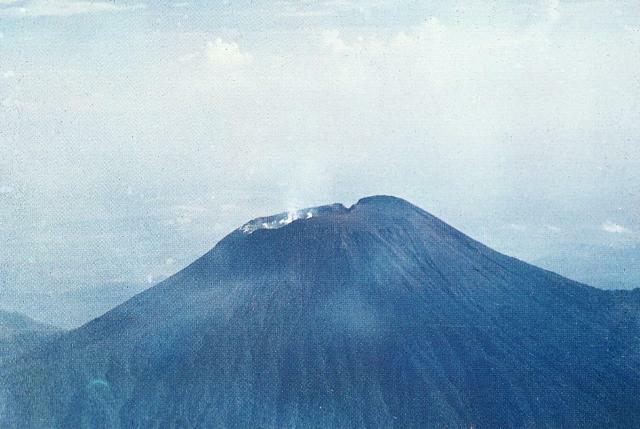 In addition, the eruption of Tolbachik in July 1975 generated flames (Fedotov, 1984), and blue flames were associated with active vents preceding the 18 May 1980 eruption at St. Helens (SEAN 05:03). During Rietze and Boeckel's 2006 visit, the active intracrater cone contained pits in both the middle and flank areas, with hundreds of small deep-orange flames (up to 2 m high) constantly burning. By 2009 the pits had filled up with debris, but new vents atop this area emitted burning gas and bursts of lava. References. Fedotov, S.A. (ed. ), 1984, The Great Fissure Tolbachik eruption, Kamchatka 1975-1976: Nauka, Moscow, Academy of Sciences of the USSR Far East Science Center, Institute of Volcanology, 637 p. (in Russian). Luhr, J., and Simkin, T., 1993, Parícutin: The volcano born in a Mexican cornfield: Geoscience Press, Phoenix, Arizona, USA. 427 p.
Information Contacts: Center of Volcanology and Geological Hazard Mitigation (CVGHM), Jalan Diponegoro 57, Bandung 40122, Indonesia (URL: http://vsi.esdm.go.id/); Darwin Volcanic Ash Advisory Centre (VAAC), Bureau of Meteorology, Northern Territory Regional Office, PO Box 40050, Casuarina, NT 0811, Australia (URL: http://www.bom.gov.au/info/vaac/); Thorsten Boeckel (URL: http://www.tboeckel.de/); Martin Rietze (URL: http://mrietze.com/i-Slamet09.htm). Slamet, Java's second highest volcano at 3428 m and one of its most active, has a cluster of about three dozen cinder cones on its lower SE-NE flanks and a single cinder cone on the western flank. It is composed of two overlapping edifices, an older basaltic-andesite to andesitic volcano on the west and a younger basaltic to basaltic-andesite one on the east. Gunung Malang II cinder cone on the upper E flank on the younger edifice fed a lava flow that extends 6 km E. Four craters occur at the summit of Gunung Slamet, with activity migrating to the SW over time. Historical eruptions, recorded since the 18th century, have originated from a 150-m-deep, 450-m-wide, steep-walled crater at the western part of the summit and have consisted of explosive eruptions generally lasting a few days to a few weeks. Reubi O, Nicholls I A, Kamenetsky V S , 2003. Early mixing and mingling in the evolution of basaltic magmas: evidence from phenocryst assemblages, Slamet Volcano, Java, Indonesia. J. Volcanol. Geotherm. Res., 119: 225-274. Sutawidjaja I S, Aswin D, Sitorus K, 1985. Geologic map of Slamet volcano, Central Java. Volc Surv Indonesia, 1:50,000 geol map. Vukadinovic D, Nichols I A, 1989. The petrogenesis of island arc basalts from Gunung Slamet volcano, Indonesia: trace element and 87Sr/86Sr constraints. Geochim Cosmochim Acta, 53: 2349-2363. There is data available for 46 Holocene eruptive periods. Remarks: Shallow-sourced inflation at Slamet preceded a period of unrest between April and September 2009. Reference List: Chaussard and Amelung 2012; Philibosian and Simons 2011. There is no Emissions History data available for Slamet. 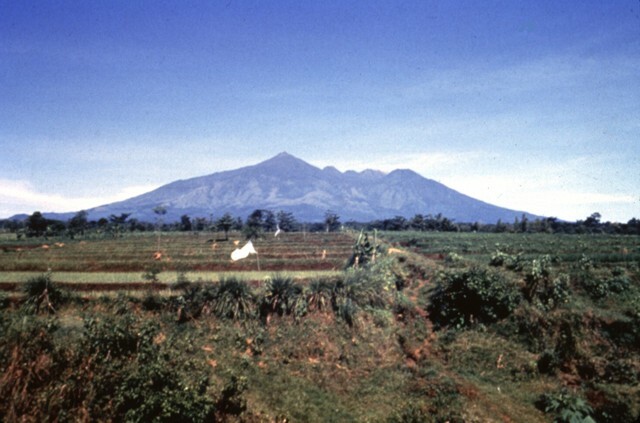 Gunung Slamet rises above farmlands on the northern coastal plain of central Java. The 3428-m-high stratovolcano, Java's second highest, is also one of its most active. The irregular ridge to the right of the sharp-peaked summit includes Gunung Penjara (right) and Gunung Malang, remnants of an older Slamet volcano. A steaming crater truncates the western side of 3428-m-high Slamet, Java's second highest volcano. Slamet is located along Java's narrow central waist. Four craters occur at the summit of Gunung Slamet, seen here from the SW. Historical eruptions at Slamet, one of Java's most active volcanoes, have been recorded since the 18th century and have originated from a 150-m-deep, 450-m-wide, steep-walled crater. The eruptions have generally been explosive, lasting a few days to a few weeks. Photo by I. Pratomo, 1990 (Volcanological Survey of Indonesia). 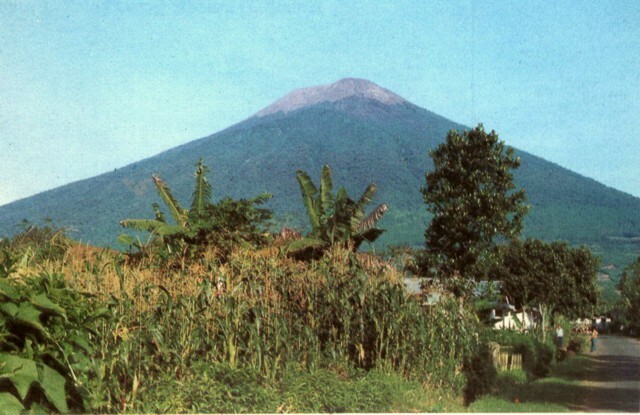 Gunung Slamet, Java's second highest volcano, towers above the village of Kutabawa. The modern volcano forms a less-vegetated cone that rises above the forested slopes of an older volcano in the foreground. Slamet is one of Java's most active volcanoes and has produced frequent explosive eruptions recorded since the 18th century. Photo by Igan Supriatna, 1990 (Volcanological Survey of Indonesia). An aerial view from the SW of the summit of Slamet volcano shows the four overlapping craters capping the volcano. Activity has migrated to the SW, where the youngest and deepest crater is located. This crater, whose floor is obscured by clouds, is 450 m wide and more than 150 m deep. There are no samples for Slamet in the Smithsonian's NMNH Department of Mineral Sciences Rock and Ore collection. Large Eruptions of Slamet Information about large Quaternary eruptions (VEI >= 4) is cataloged in the Large Magnitude Explosive Volcanic Eruptions (LaMEVE) database of the Volcano Global Risk Identification and Analysis Project (VOGRIPA).